I dislike shopping, unless it is for, say, dinner party ingredients, or perhaps used books at the library’s twice-yearly sale. Generally I try to purchase everything possible online. 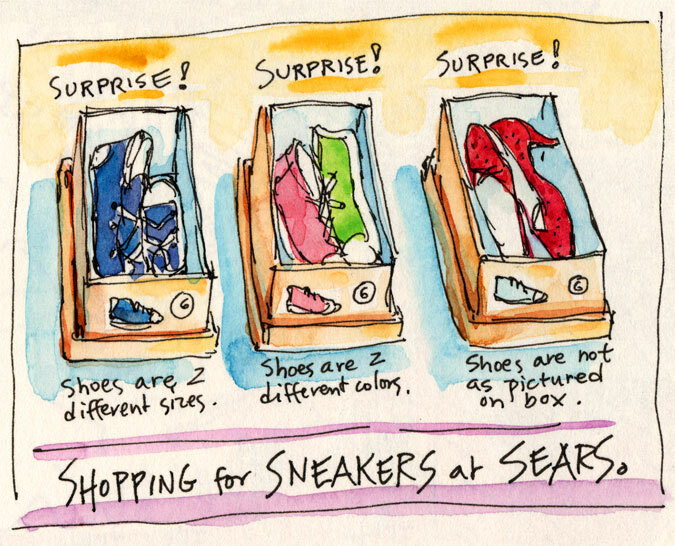 However, this is tough with shoes, so I agreed to take my daughter into a Sears store to acquire for her a pair of coveted Converse sneakers. I remember when this meant sitting down in a chair, being fitted by a chatty salesman, and having boxes fetched from a secret room. What a surprise! no chairs, no salesman, no secret room. (This is probably the result of so many folks shopping online. Uh-oh.) Instead, we had a lengthy and baffling search through fifty boxes in order to find two matching shoes in the correct size. Like a treasure hunt. Or a bizarre dream sequence. We were eventually successful.